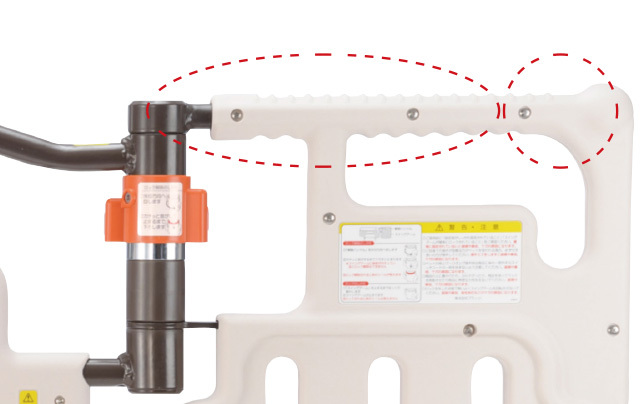 Lock release can be done easily with the user’s palm or fingers without strength. 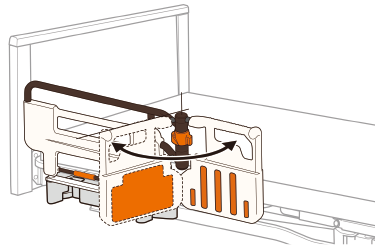 Improved conventional design has enabled smoother operation. The grips shape has been designed for easy gripping, featured with spherical design on the edge and wave design on the rail. Universal design of requiring palm or fingers to release. 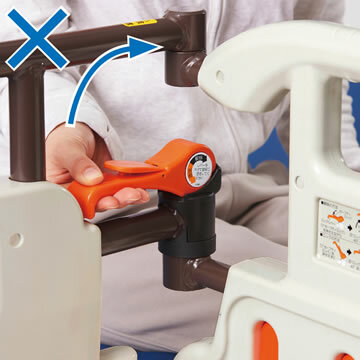 To avoid unexpected accidents, safety lock is required to release the lock. 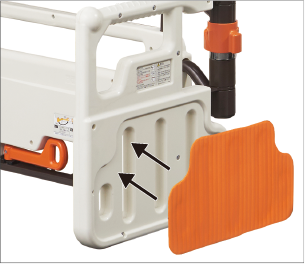 Swing arm grip can be locked every 22.5 degrees. 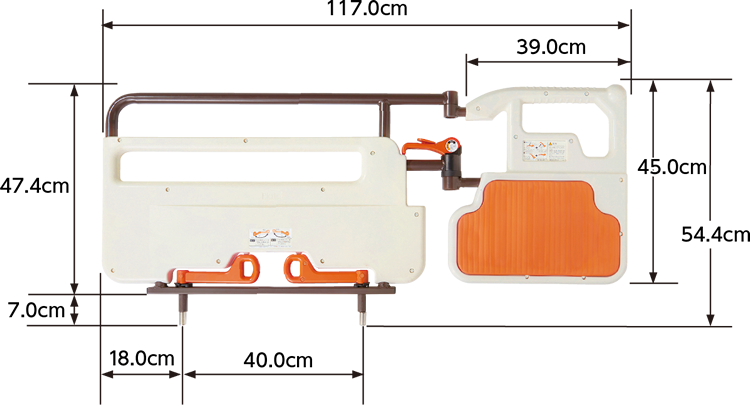 Insert the double bed grip pins into the side rail holder and turn two levers on the bottom inward to securely attach to the bed. 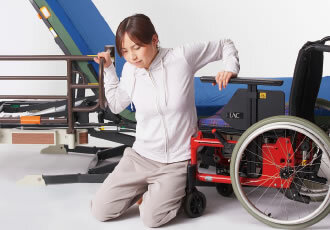 Injury of neck and other body parts between rails or between rail and board is common. 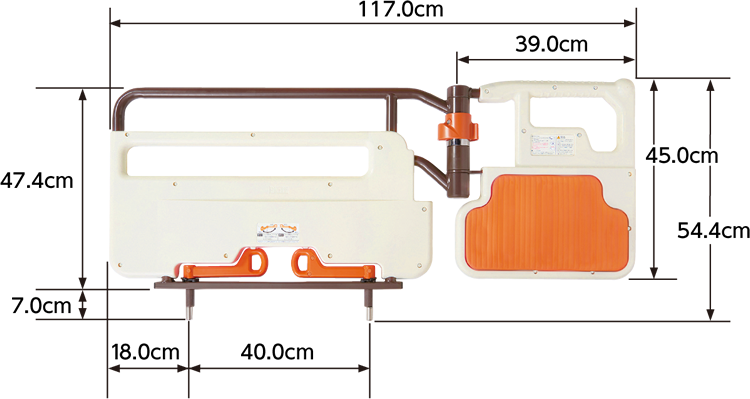 Kneeparo is designed with safety gap dimensions to avoid such accidents. 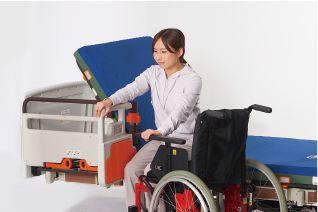 This grip is used when the bed user stands up to move to a wheelchair or between a portable toilet and the bed. 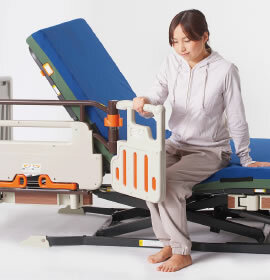 When not in use, it can work as a stopper to prevent the bed user from falling from the bed. 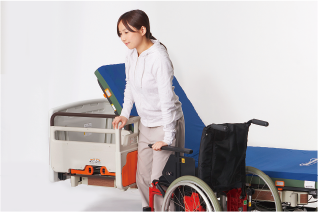 Fundamental movement when transferring is to “adjust the height of bed.”When transferring from bed to wheelchair, have your bed height adjusted slightly higher than wheelchair seat. 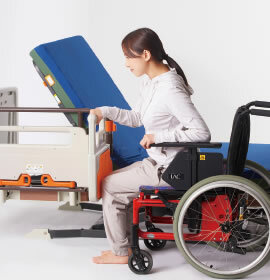 Conversely, when transferring from wheelchair to bed, have your bed height adjusted slightly lower than wheelchair seat. Open grip 90 degrees and have knees cushioned to the pad. Have bed height higher than wheelchair. 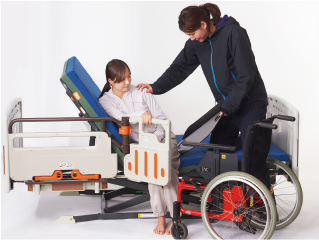 Position wheelchair along bed and apply brakes. Move forward the leg on the wheelchair side. Please be careful not to move the other leg as you could injure yourself. Have knees along the pad and stand up, or raise your bottom. 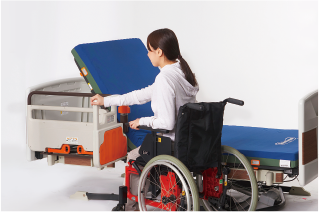 Lift up the back rest of the bed, set the bed height slightly higher than the wheelchair and set the grip part at an angle of 45 degrees. Lock the brake of the wheelchair. Move forward the left leg. Please be careful not to move the other leg as you could injure yourself. 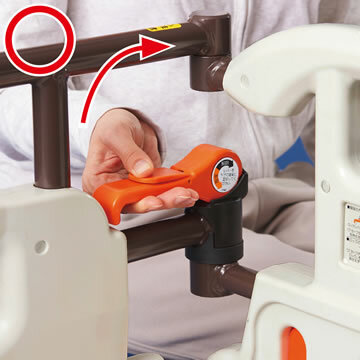 Make the patient hold the grip and place one edge of the board under the patient’s left buttock and the other on the center of the wheelchair seat. 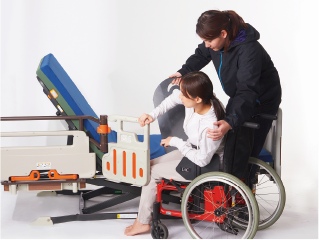 The caregiver should instruct the patient to grip the wheelchair armrest and pull. The caregiver should then place their right foot on the bed. 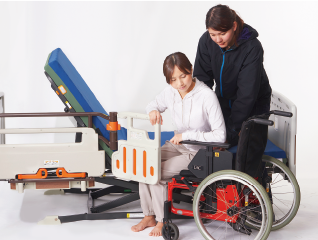 Support the left side of the waist, lean the patient towards the left arm, slightly push the right side of the buttocks, and move the patient into the wheelchair. 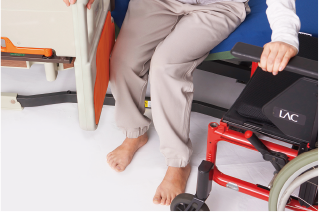 Use the left foot to make sure the wheelchair does not move when transferring the patient. 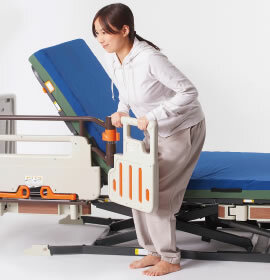 Lean the body toward the right side to shift the body weight on the right buttock and move the patient’s body until the patient sits firmly in the wheelchair. 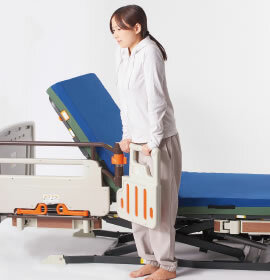 To make the transfer board easier to remove, shift the patient’s body to the left, lift the transfer board and move it back and forth to remove it. * Carelet Series is not compatible. 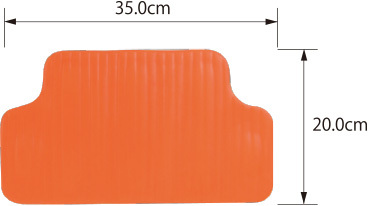 Impact absorber (EVA resin) is used for the pad.